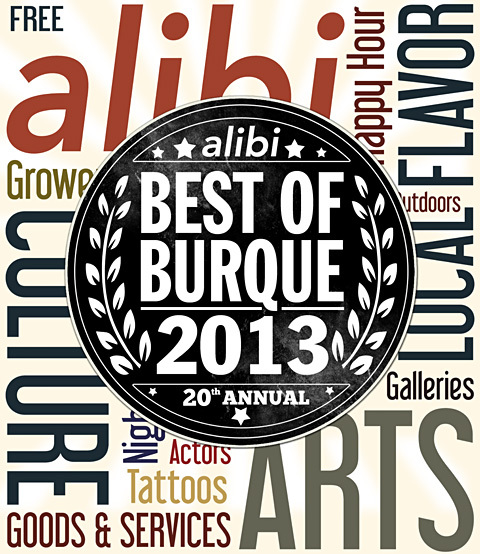 Dear Best of Burque, you sure are a Lot of Worque. We all love our Burque, but sometimes we forget to say so out loud. For 20 years and counting, the Weekly Alibi has told the Burque Monster that we love it by counting up thousands and thousands of votes and boiling them down into the definitive things our readers love about living here. Some things are different, some things stay the same. You can think of it as a love letter. To the Burque. Best Bike Trail, Best City Politician to be Awarded a Medal, Best News Anchor We Want to Wear a Cowboy Hat for an Entire Broadcast, Best "Breaking Bad" Location and more winners in essential Burqueñosity. ﻿Best Art Gallery, Best Theater Space, Best Comedy Troupe and Best Pointillist-Cubist-Structuralist Work of Art Created in a Vacuum Tube. Kidding. Best Bakery, Best Butcher/Meat Counter, Best Liquor Store and other besty tastes—er, tasty bests. Best Bar Staff, Best Swanky Bar, Best Bar for Dancing and other bars that are the best, bar none. ﻿Best Adult Shop, Best Comic Book Store, Best Yoga or Pilates Studio, Best Pest Control and all them other bestests that you pay people for.